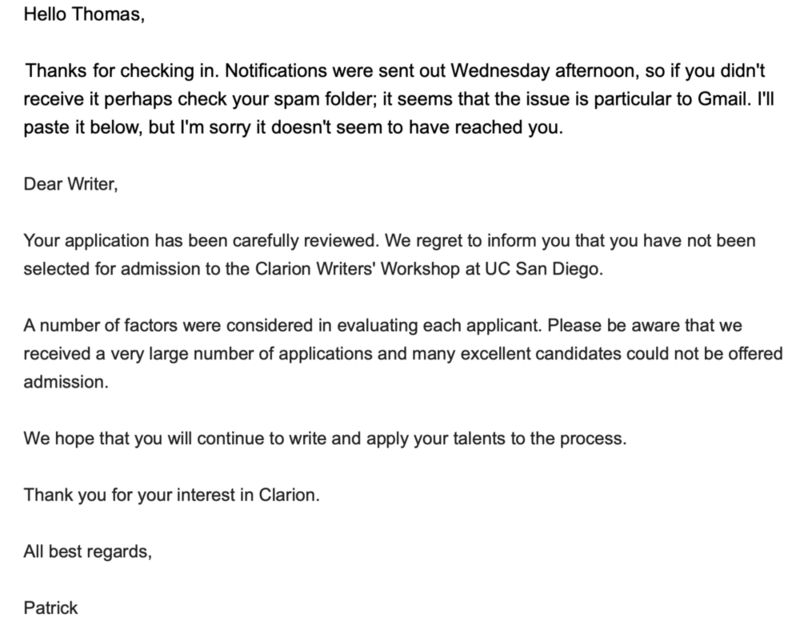 Another year, another Clarion West rejection. This year I also applied to the Clarion Workshop. That, too, didn’t work out so great. To keep the tradition alive, I’m posting my Clarion West application essay. Last October I was in L.A. visiting a friend. It was Sunday night, and we had just arrived at a Mexican restaurant. About six people were standing in the parking lot, looking up at the sky with wonder in their eyes. A magnificent glow took up a third of the sky. Within it, two balls of light drifted away from one another. One was descending back to Earth, while the other was still ascending to the heavens. Hyperbole aside, it was a Space-X launch out of Vandenberg Air Force Base. It was also the first time I’d ever seen a rocket launch. At that moment, I relived my childhood love affair with space travel. It was one that included multiple viewings of Apollo 13, attending Space Camp thrice, and telling everyone I would be the first man on Mars. Unfortunately, that love affair faded when I became old enough to realize just how much actual math and science go into space flight. I didn’t want to be an engineer, scientist, or pilot. I turned my attention from astronaut dreams to short stories, first writing a book’s worth of god-awful fan-fiction before feeling confident enough to create original characters and situations. It was then I realized that I didn’t need a math or science degree to make a spaceship fly, a cyborg walk, or a telescope find an extraterrestrial civilization. I just needed my imagination. I took two creative writing courses during my senior year of college, and after graduation, I started submitting stories. It took four years, but I sold my first story in 2012. Another four years of hard work resulted in my first professional sale; I joined SFWA in 2016. While writing stories, I taught high school English in Middle Tennessee for a few years before moving to Northern California in January 2015. Since then, I’ve bounced around the North Bay, but I know I’m here to stay. I’m a freelance writer. I use my teaching experience to create educational products – blog posts, test questions, study guides, website copy – for clients. I also do some local journalism on the side. Freelancing can be hectic and unstable, but I’ve carved out something nice, something that for the longest time I thought was impossible. My profession also gives me the freedom to apply to, and, fingers crossed, attend Clarion West. It would be too easy to tell you that my goal for attending Clarion West is to take my writing to the next level. That’s what everyone who applies wants, so stating that alone isn’t enough. Let me tell you why I want to take my writing to the next level. “I send my rockets forth between my ears, hoping an inch of good is worth a pound of years.” Bradbury’s poetry struck a chord with me. I’ve been writing short stories since I was 14, almost 20 years. And I’ll be writing short stories for the rest of my life. I’m applying to Clarion West because I know that hope alone won’t make my pound of years into an inch of good. I am ready to commit blood, sweat, and tears to ensure that my inch not only exists, but is the best it can be. I think the greatest thing I can offer my peers during the workshop is my perspective on failure and perseverance: how an abundance of the former can, with grit, encourage the latter. In other words, the 450+ rejections I have received over the last decade in no way detract from my 17 publications. I think it's a pretty decent ‘batting average' for a short story author. However, it takes time and experience for an author to gain this mindset. I want to inspire it in my peers, some of whom may have limited experience trying to publish their work. Finally, you should know about my three favorite short stories. They are, in no particular order, “Cathedral” by Raymond Carver, “The Light of Other Days” by Bob Shaw, and “The Manned Missiles” by Kurt Vonnegut. Every time I sit down to write a new story, my goal is to affect my readers in the same meaningful way that these three stories affected me when I first read them. Thank you for taking the time to get to know me. I look forward to meeting you this summer and benefiting from your guidance. The Barlow is Back in Business!